Shirtwaists' popularity had blown up in the early 1900s. NO MORE were the one-piece dresses of your mother's day. Now it was all about the shirt and skirt combo of the future. Many of these shirtwaists were made in factories on the Lower East Side of New York City. The idea of an 8-hour work day was almost a joke, women were frequently sexually harassed or assaulted by their bosses or other male workers, there were almost no safety regulations, and they were (unsurprisingly) paid much less than their male counterparts. And so the Uprising of the 20,000 began. 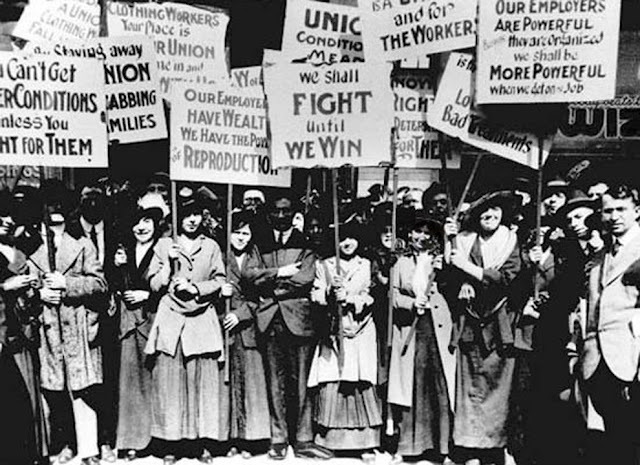 Women walked the picket line despite frequent beatings, arrest, freezing temperatures, and a rapidly diminishing strike fund. Smaller shops started giving into their demands, but larger companies (like Triangle) would not capitulate. They hired scabs, as well as thugs to attack the women in the streets. They paid off judges to put the women in rough jails when similar strikes by men had yielded no more than half a dozen arrests total. One of the most remarkable things that came from the strike was the previously unheard-of support across class lines. 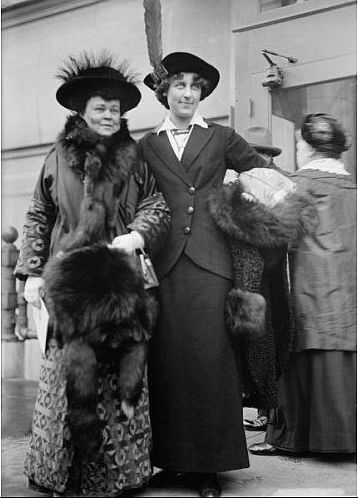 While some of this support would later end due to friction, it remains a fact that a number of New York's upper upper class grande dames, such as the difficult Alva Belmont and J.P. Morgan's daughter Anne Morgan, contributed considerable time, resources, and support to the strike, while a parallel situation was not seen in men's strikes. The reasons for this are debatable. Sentiment makes one want to say it was the purity of sisterhood or some similar reason. It seems likely that it was most likely a combination of women's disenfranchised position, and their tendency to be raised to believe their place is to help others. These upper class women were called "the Mink Brigade." 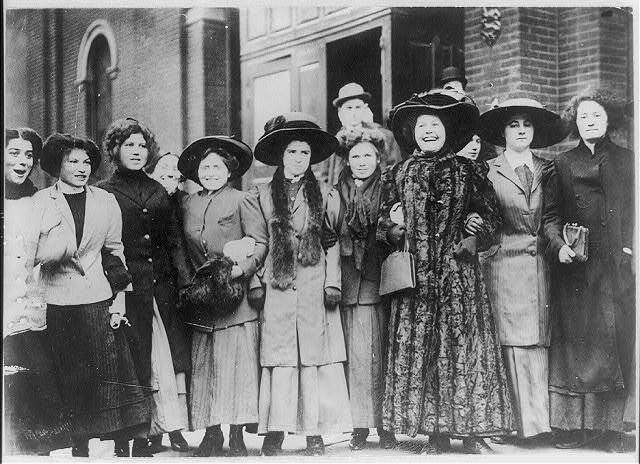 Other cross-class groups/women to help in the Uprising included Mary Dreier, a New York social reformer whose arrest on the picket line would lead to increased public support, and the college girls. I love the college girls. Unlike women like Anne Morgan, they stayed until the bitter end. The college girls came because the union sent women workers like Pauline Newman and Rose Schneiderman (who later worked with FDR) on speaking tours around the Northeast. Girls from women's colleges like Vassar, Wellesley, and Bryn Mawr started showing up on the picket line. Bryn Mawr graduate and heiress Carola Woerishoffer bought houses, and "haunted the entrance to the Jefferson Market Court at Sixth Avenue and Tenth Street and whenever another group of arrested strikers was marched before a magistrate, she was with them in front of the bench armed with a deed, ready to slap it down for their release." Vassar graduate and lawyer-in-training Inez Milholland, later known as a martyr to American women's suffrage (she collapsed and died due to complications from pernicious anemia while on a pro-suffrage speaking tour), was on hand to offer free legal advice. This attention and help changed the way the strikers saw themselves. 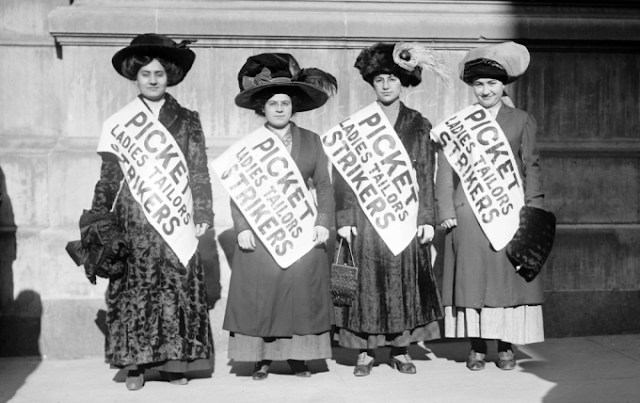 The women who came to their aid made them feel like "not victims in need of pity, but fighters. . .It stiffened the spines of the shirtwaist strikers and made them proud of being exactly what they were -- workers, immigrants." 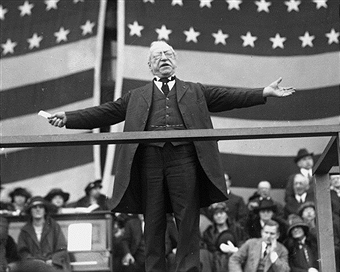 The strike came to an end on February 15, 1910, a little more than a year before the Triangle fire. Out of 353 companies, 339 agreed to most of the strikers' terms. 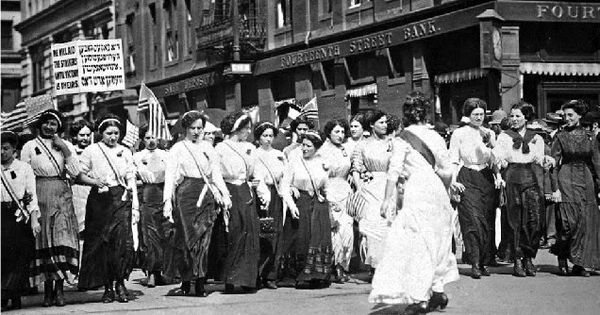 The shirtwaist workers proved women could be a formidable force for the union. One of the companies not to capitulate was, of course, Triangle. When the fire occurred in 1911, it was said that the police who had been beating the women in the street the year before were now picking their bodies up from the sidewalk. The strike not only gave these thousands of women a stronger sense of worth, but gave them the knowledge they could make a difference. Many became suffragists as a result of the strike, as they learned their voices were worth being heard. The Uprising of the 20,000 changed at least as many lives as participated in it.